It’s true some people believe that there is no replacement for displacement, but that’s honestly a mindset that is becoming more and more obsolete with how good and easily tune-able turbocharged cars are. 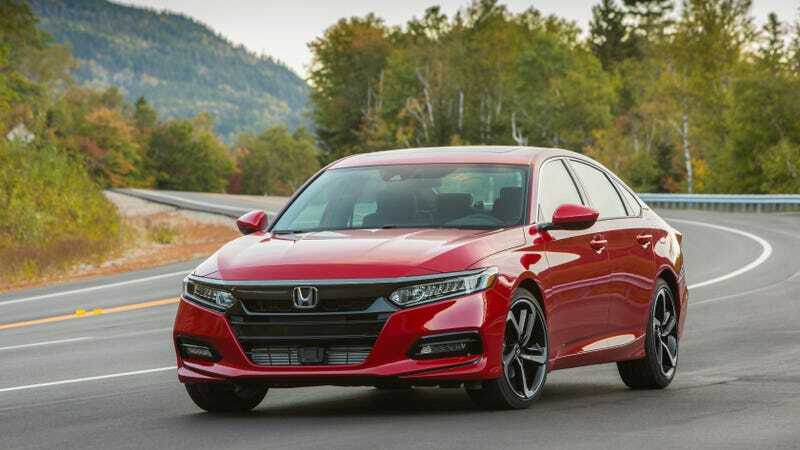 The latest is the 2018 Honda Accord with the turbocharged 2.0-liter engine. The good folks over at Honda tuner Hondata dynoed a stock Accord with the 2.0-liter turbocharged engine, which is detuned from the Civic Type R’s 306-HP output down to a factory-claimed 252 HP. Their readings found that it actually produced 266 HP to the wheels, according to Motor Trend. Of course, all of that effort was to showcase Hondata’s new toy: a FlashPro device with two stages. They claim that the Stage 1 tune increases the engine output up by 10 horsepower and 40 lb-ft of torque. However, the Stage 2 tune adds an additional 40 to 45 lb-ft of torque, to make a total of about 80 extra lb-ft of torque over the stock motor’s peak output. And with a torque increase across the entire rev range, there’s a significant horsepower increase as well. You can see Hondata’s findings below; the Stage 2 tune looks like it increases peak horsepower to about 285 at the wheels. And now for some Jalopnik math. Let’s say the drivetrain loss for a front-wheel drive car is around 15 percent. If the Accord is now making 285 at the wheels, our equation would be: crank horsepower = wheel horsepower / 85 percent, which gives us around 335 HP at the crank—higher than the Type R’s claimed power output. In their video, Hondata says that the tune increases mid-range (3,000 and 4,000 RPM) horsepower over stock by about 50 to 55 HP, corresponding to a torque increase in that rev range of approximately between 60 and 100 lb-ft.
Bear in mind that Hondata’s FlashPro only works on 2018 or newer Honda Accords with the 2.0-liter engine, as Motor Trend points out. It connects to the ODBII port and you don’t need any ECU modifications, but you will require a computer with a USB 2.0 connection. I’m utterly charmed by this idea: Tuning a Honda Accord to have 335 HP? It’d be the ultimate sleeper car!